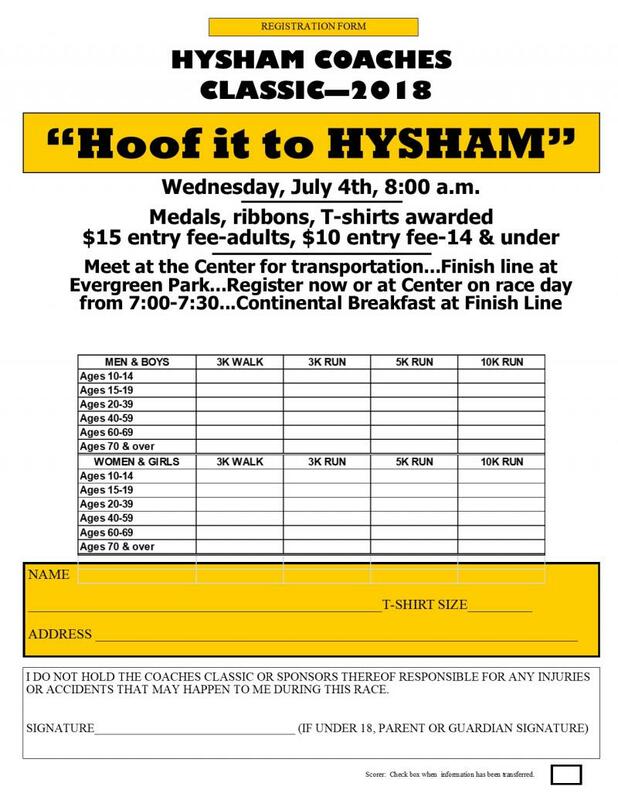 The 2018 Hysham Coaches Classic "Hoof it to HYSHAM" will be Wednesday, July 4th at 8:00 a.m. There is a $15 entry fee for adults; $10 for age 14 and under. Meet at the Community Center (across from the Court House) for transportation. Finish line will be at Evergreen Park on the town's main street. Registration is at the Community Center on race day from 7:00 - 7:30 a.m. Complete the form there or print the form now and bring completed form on race day. Medals, ribbons, and T-shirts will be awarded. A group photo will be taken in front of the Yucca Theatre. Join the Hysham Chamber of Commerce for a Continental Breakfast at the Finish Line.